Portable gaming monster. While ultra-slim, high-end laptops were still rare in 2013, there are now quite a few slim gaming machines. 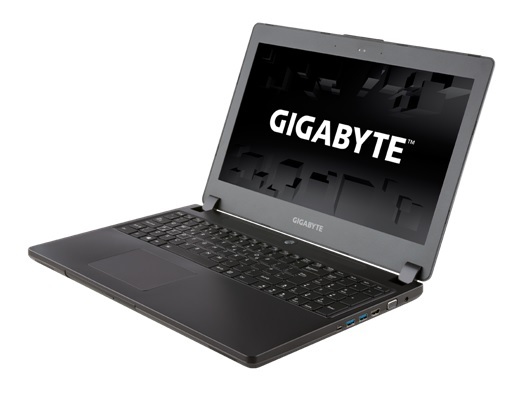 Gigabyte introduces the P35X v3, an extremely high-performance model based on the GeForce 980M. Unlike the P35W v3 that is powered by a GeForce GTX 970M, the fastest laptop GPU currently available has been installed in the P35X v3. As the review of MSI's GT72 2QE proved, the top-of-the-line model provides outstanding performance and can render most games, even in maximum details and using enabled anti-aliasing. The biggest difference to MSI's counterpart is the obviously slimmer build. Rather than 4.8 centimeters (~1.89 inches), the P35X v3 has a height of only 2.1 centimeters (~0.8 inches). 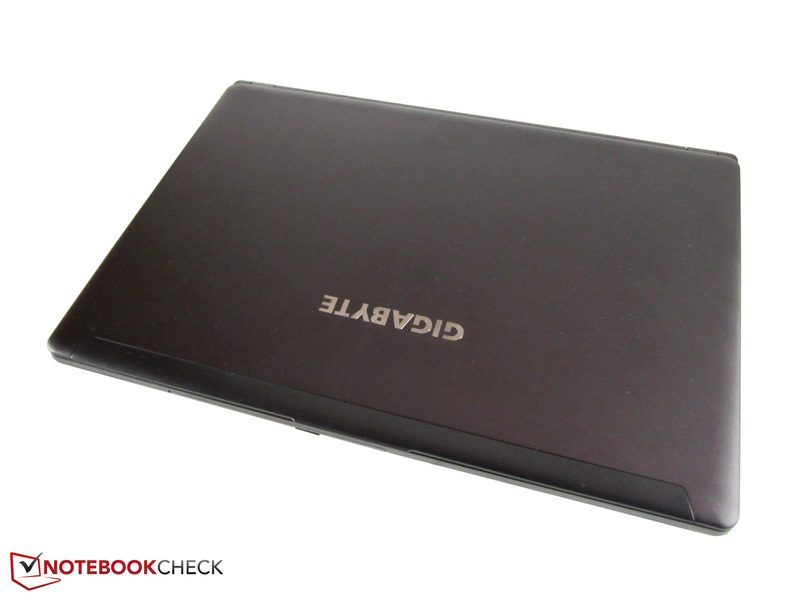 The thin build and relatively low weight (~2.5 kg; ~5.5 lb) make carrying the 15-inch device easy. 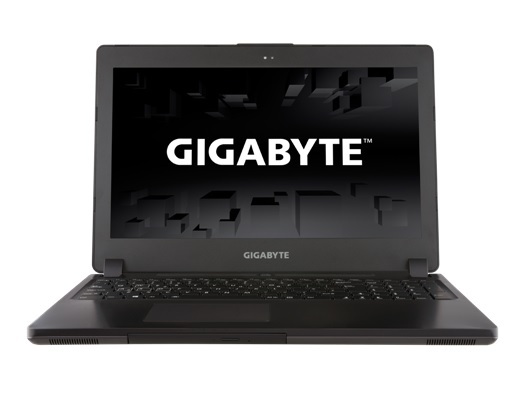 Despite the small dimensions, Gigabyte packs a lot of technology under the hood. 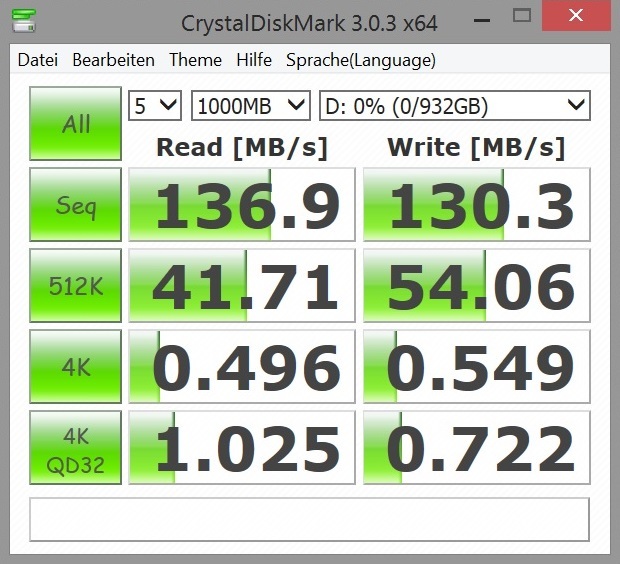 The review sample can boast of two mSATA SSDs in a RAID 0 array, and a 1000 GB HDD. 16 GB of DDR3 RAM should also be enough for the next few years. Users with an exceptional amount of data can replace the DVD burner with a 2.5-inch storage. Fantastic: the matching hot-swap frame is included with the laptop. The most important unique selling point is the high-definition WQHD+ screen. The premium-range model can render a total of 2880x1620 pixels natively. Whether the casing, connectivity and input devices are compelling, can be read in the review of the identically build P35W v2. Our article jumps right to the display. Although 3K and 4K screens are still causing problems (windows and fonts frequently too small), the technology is becoming more and more popular. FHD users initially have to get used to the high pixel density and sharp image impression, but after a while, they will get used to the resolution. 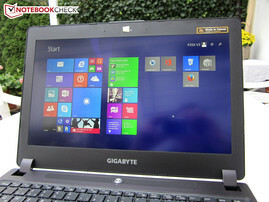 Fortunately, Gigabyte opted for a high-quality WQHD+ screen. The Panasonic VVX16T028J00 is not only able to interpolate well (1920x1080 pixels are extremely crisp), but it also has an excellent brightness. The average brightness of 350 cd/m² makes the Panasonic brighter than the majority of the competition. Even the 4K screen in Schenker's XMG P505 (Sharp LQ156D1JX01B) has to bow down before the P35X v3 here. The 15-inch laptop does not do quite so well with the black level. 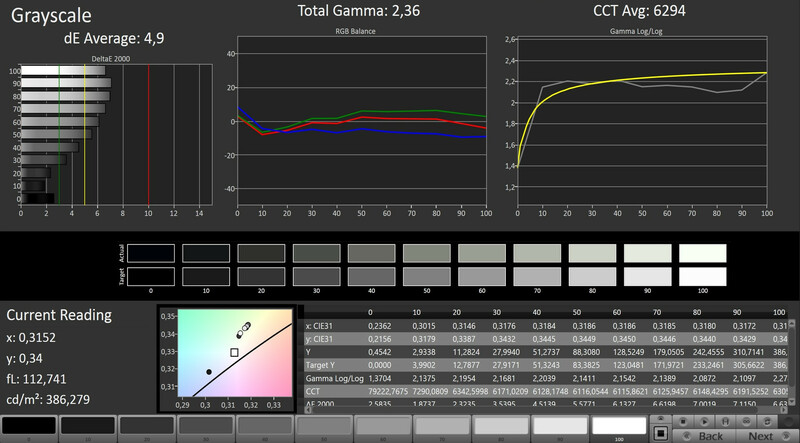 Though 0.45 cd/m² are not at all bad, dark movie and game scenes look a bit grayish. Schenker's XMG P505 provides a richer black with 0.21 cd/m². Nevertheless, the pictures rendered by the P35X v3 are compelling. As well as the illumination (90%), the contrast (~830:1) is also above average. 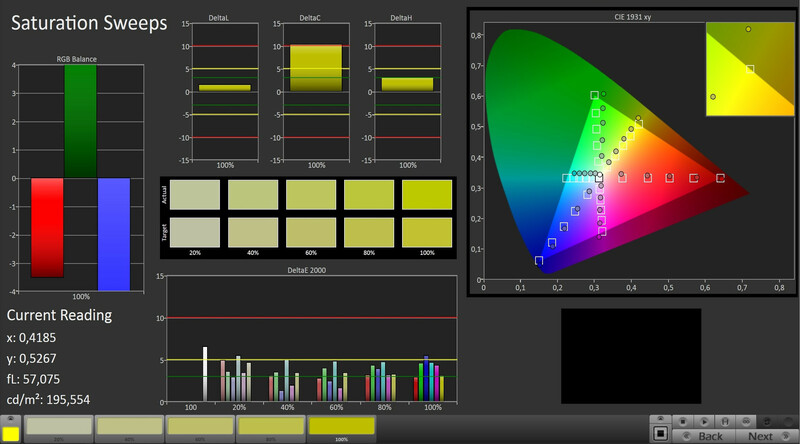 The screen deserves particularly high praise for its color reproduction. 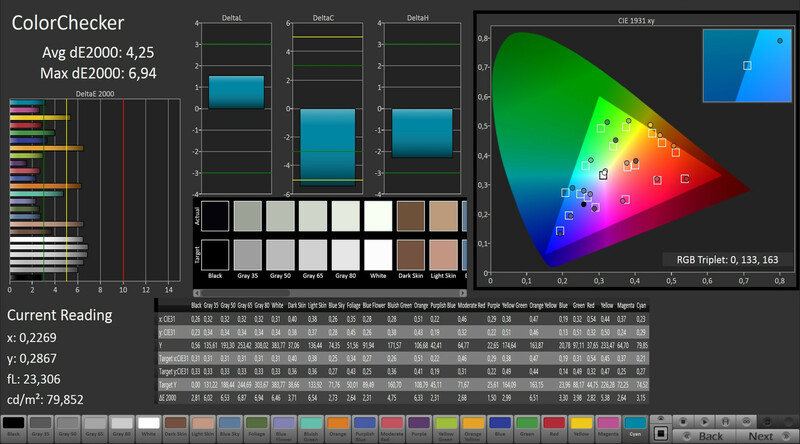 While the other screens exhibit a strong bluish cast, the P35X v3 produces a very balanced and natural image. 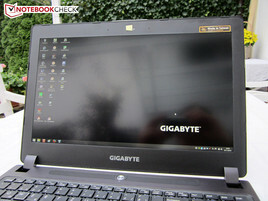 This makes the fact that Gigabyte does not use a reflective screen, all the more pleasing. Thanks to the matte finish, reflections are the exception rather than the rule. The laptop is therefore suitable for use outdoors. The viewing angles left a mixed impression. 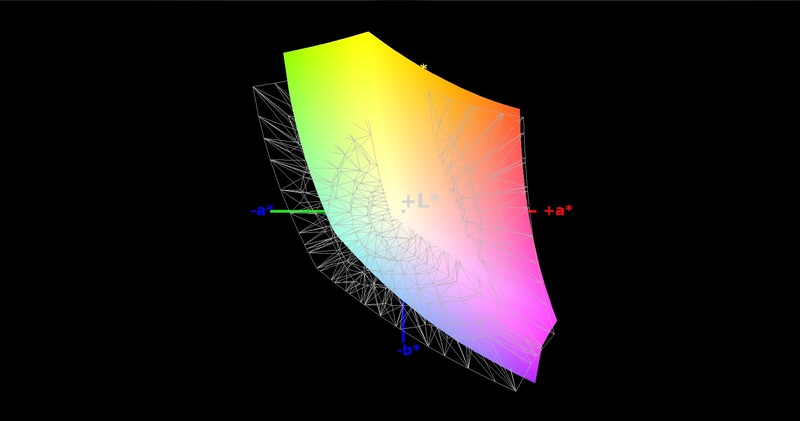 Of course, the image fidelity is higher than in a TN screen when looking at an angle from below. 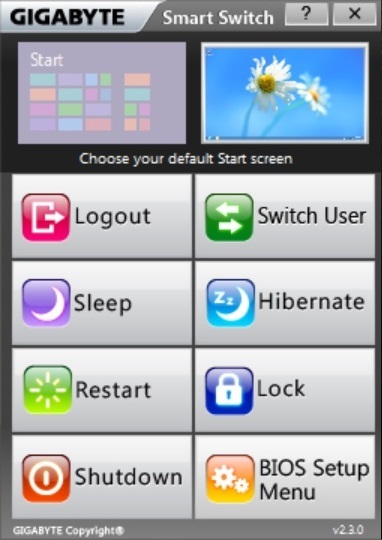 However, brightness changes are noticed when closing the lid; the screen looks too bright. Apart from that, the screen does an almost perfect job. Users should not need to reduce the quality level and/or anti-aliasing in demanding games, and can even still play in the native resolution. Battlefield 4 still ran fairly smoothly using the Ultra preset (37 fps @ WQHD+ vs. 71 fps @ FHD). 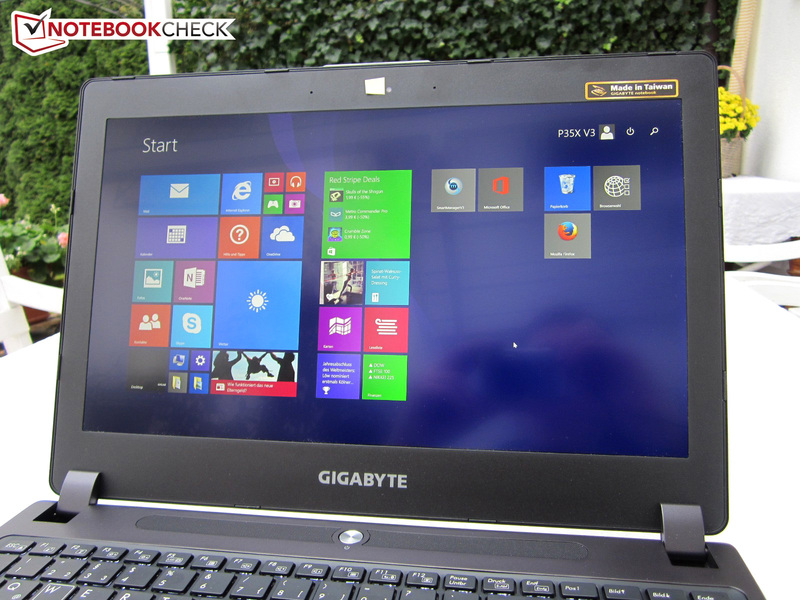 It is no surprise that Gigabyte is installed with a quad-core processor from Intel's Haswell generation. 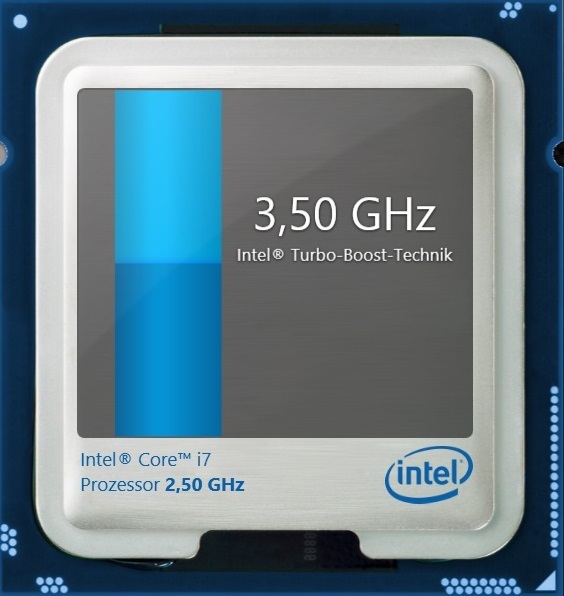 The fast 2.5 - 3.5 GHz Core i7-4710HQ is known from the (indirect) precursor. Like most of its brothers, the 22 nm product features a six MB L3 cache. Intel specifies its TDP with 47 Watts, which is still justified considering its power. The P35X v3 uses the Optimus technology from Nvidia to save as much energy as possible. 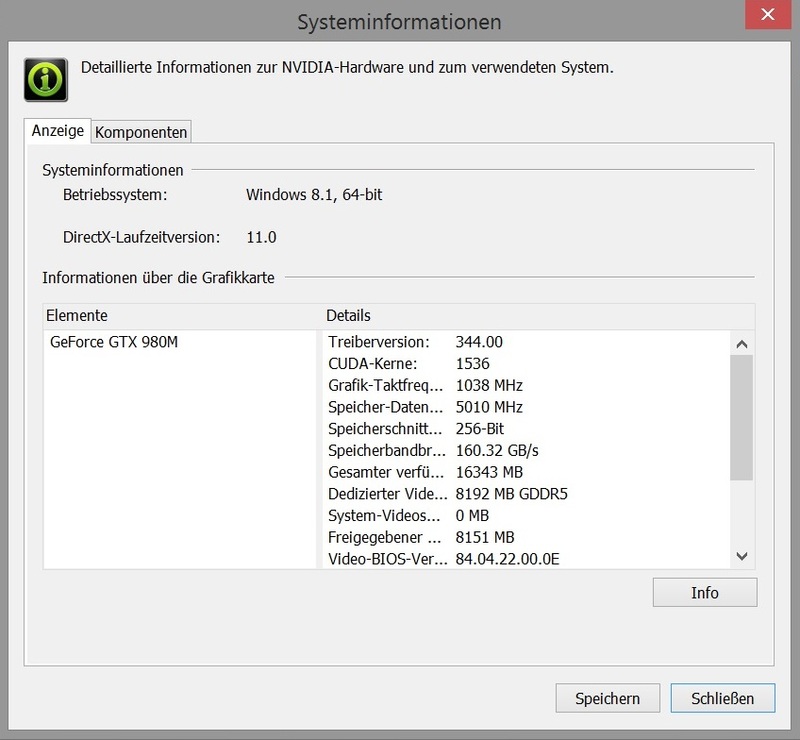 Depending on the requirement, either the GTX 980M, or the processor-integrated graphics chip is enabled. 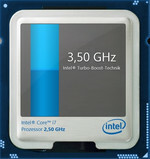 Intel's HD Graphics 4600 copes reliably with routine tasks (videos, Internet browser, documents, etc.). Unfortunately, the P35X v3 has inherited the phenomenon of a limited Turbo. 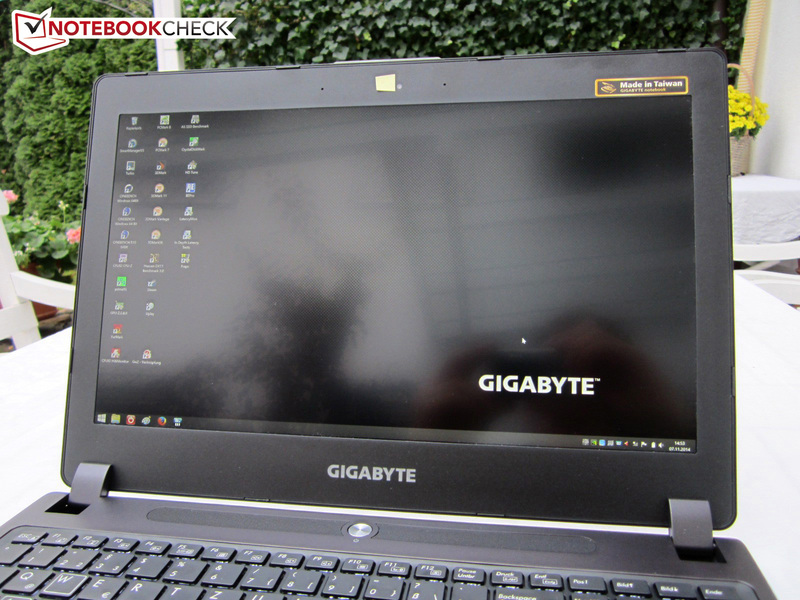 While other 4710HQ laptops accomplish up to 3.3 GHz in multi-core scenarios, Gigabyte's laptop settled at 3.0 - 3.2 GHz. 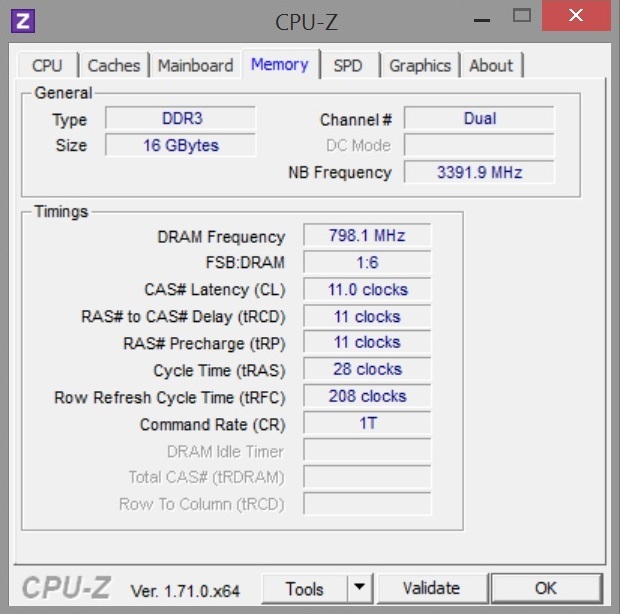 The clock sometimes even dropped to 2.5 - 3.0 GHz in 3D applications. A short throttling could be observed occasionally (single cores slipped below the base rate for a fraction of a second). However, the Turbo Boost was always enabled during pure processor benchmarks. 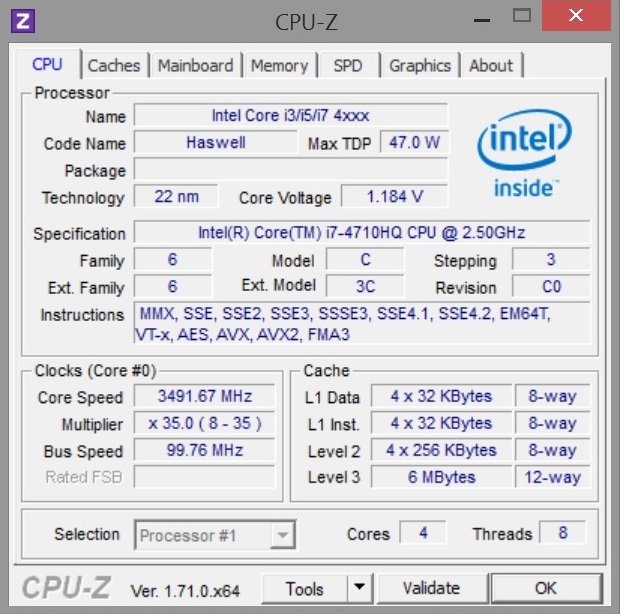 Although the Core i7-4710HQ calculates faster than in the P35W v2 in some cases, the CPU performance does not quite reach the level of MSI's GT72, which is also based on a 4710HQ. 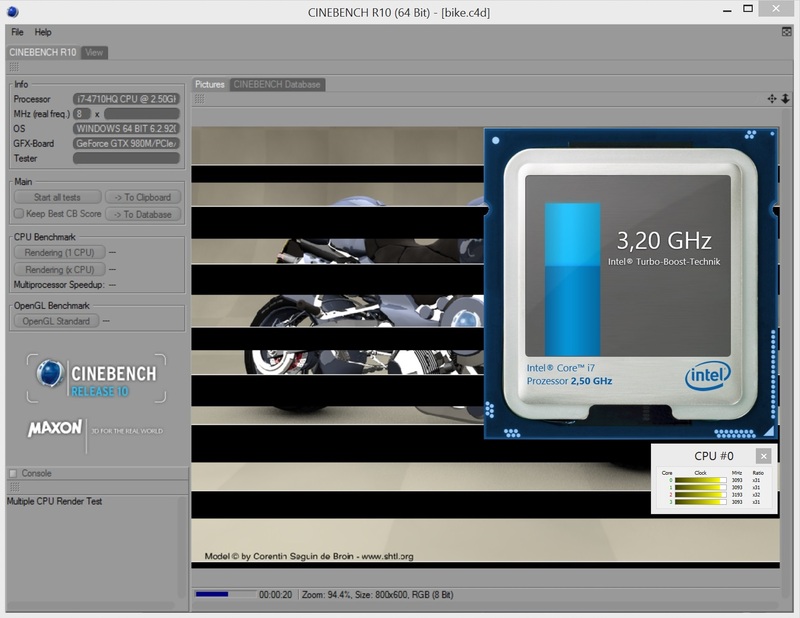 MSI's laptop has a lead of almost 4% in Cinebench R15 multi-core rendering (657 vs. 629 points). 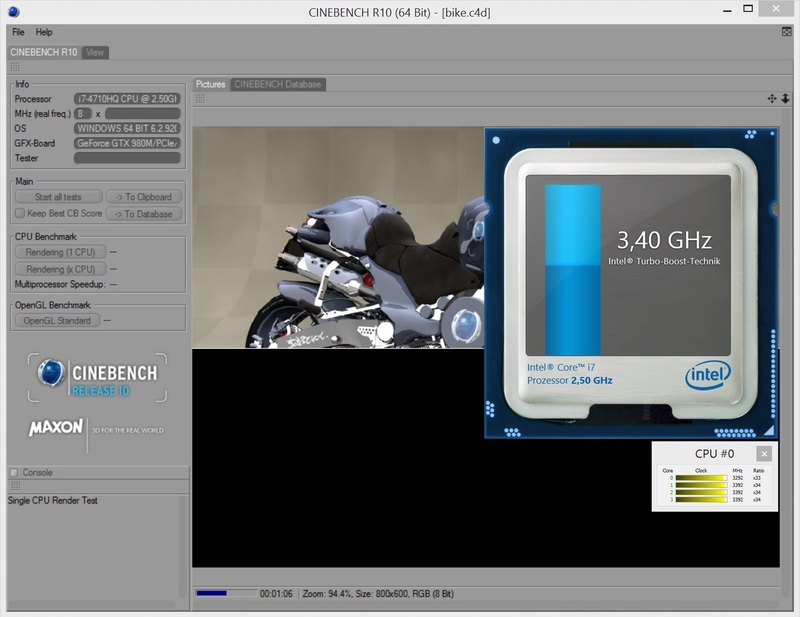 On the other hand, the difference is approximately 6% in Cinebench R11.5 (7.15 vs. 6.75 points). The gap with the Core i7-4870HQ is even bigger. 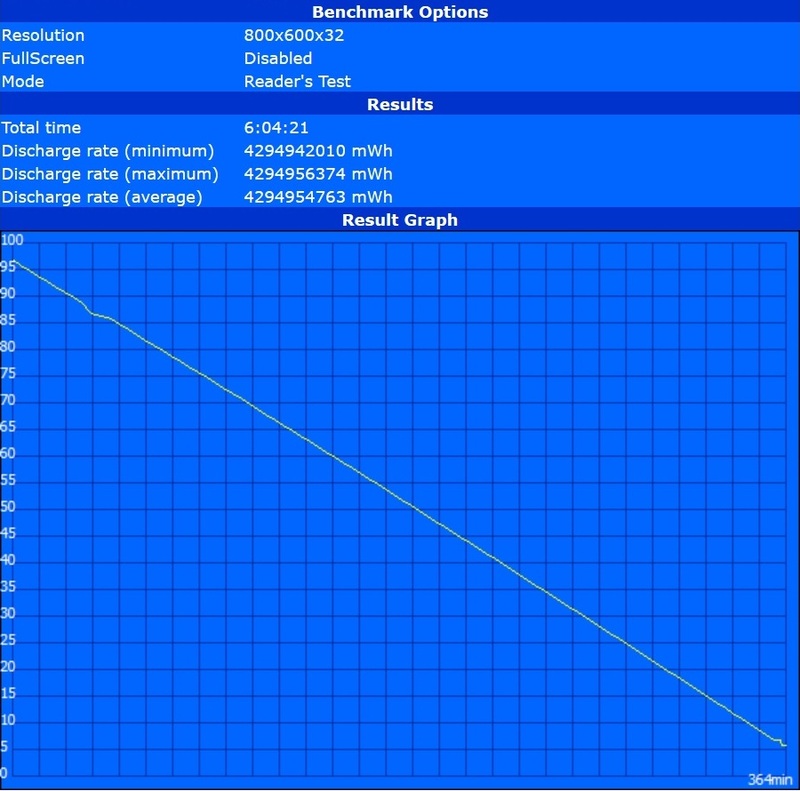 Schenker's XMG P505 achieved over 10% more in this test. Overall, the results are similar to that of Aorus' X7 Pro that also struggles with CPU clock issues. After months and months of waiting, Nvidia has now finally given its premium-range series the Maxwell architecture. Compared to the GeForce GTX 870M and GTX 880M the Shader units have not been increased, but the Kepler successor is very efficient. In conjunction with the improved clock rates, the GTX 970M and GTX 980M clearly stand out from the older models. For example, the latter model achieves 1038 rather than the previous 954 MHz. 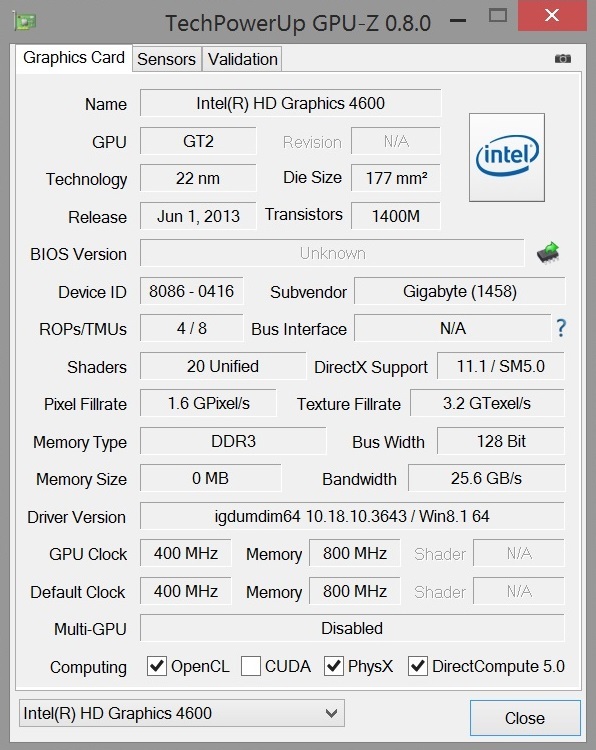 Even up to 1127 MHz are possible via GPU Boost. If the GPU-Z recordings are true, the graphics core always operates at maximum - at least in 3D programs. The video memory capacity is identical; 8 GB of GDDR5 VRAM (some laptops only have 4 GB) does not permit criticism. The same is true for the 256-bit memory interface. 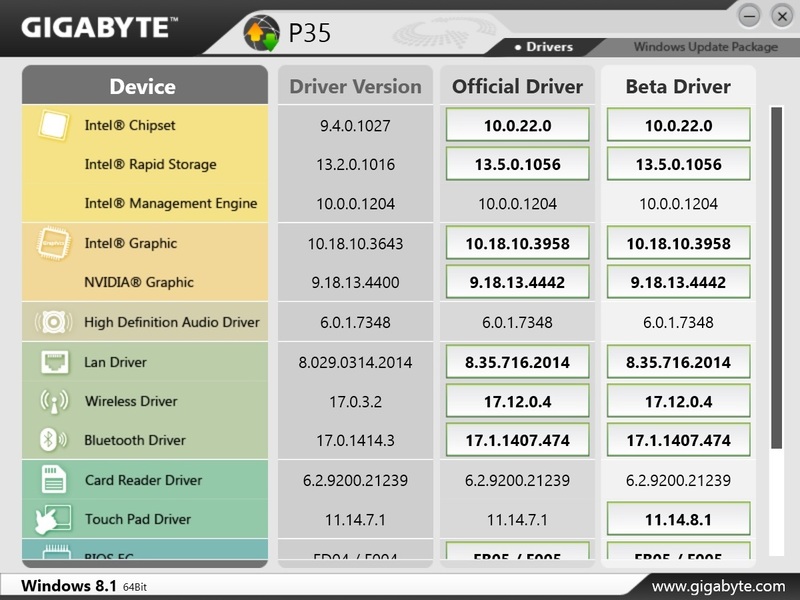 The driver version 344.00 was preloaded on the review sample. We know from the MSI's GT72 2QE that the GTX 980M provides brute power. Owing to the active Turbo, the GT72 not only scored slightly better in the processor tests, but also in the graphic benchmarks - no matter whether it was in the Fire Strike test of 3DMark 11 (GPU score: 9809 vs. 9741 points) or in Unigine Heaven 3.0 (119 vs. 110.3 fps). However, the lower CPU clock is barely noticeable since the differences usually are within a single-digit percent range. MSI's GT72 wins by almost 7% when all benchmarks are totaled (Ultra). However, a 3.8 kilogram (~8.4 lb) casing has a lot more room for cooling. 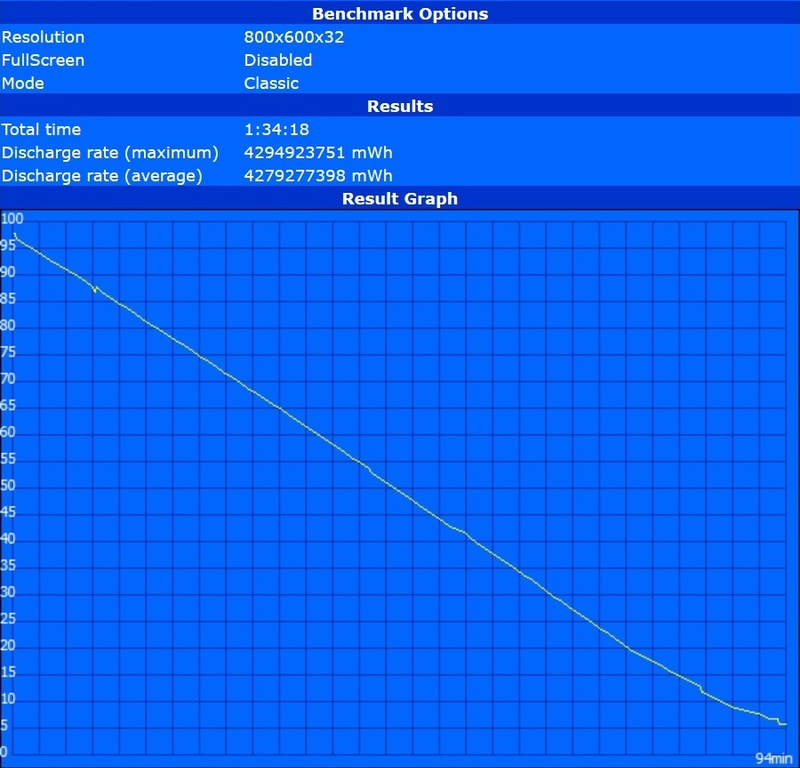 Schenker's XMG P505 slim rival calculates between 10 and 30% slower with the GTX 970M. The P35X v3 does not stand a chance against the SLI array in Aorus X7 Pro - with a few exceptions. Both GTX 970Ms calculate roughly 30% faster on average. 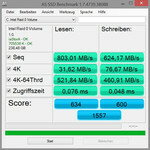 Despite the dubious advantage, two mSATA SSDs are combined to a RAID 0 array. 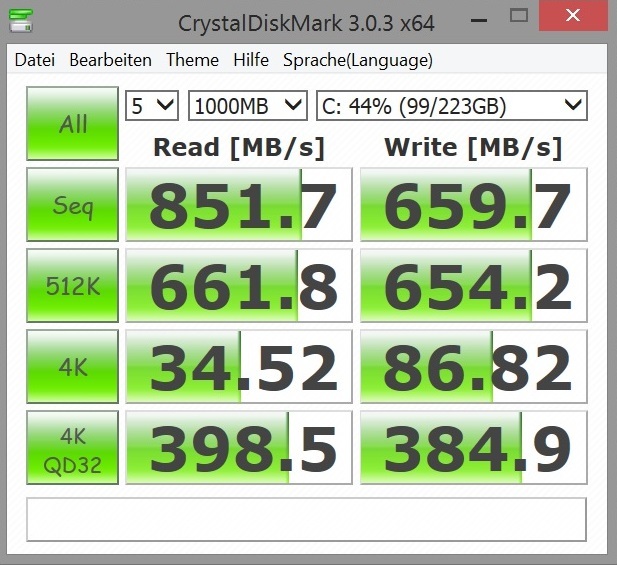 803 MB/s in sequential read and 624 MB7s in sequential write (AS SSD benchmark) are absolutely awe-inspiring. However, Windows does not give a subjectively faster impression here than on a non-RAID laptop. The main reason for this is the performance in the 4K field that barely differs from a single SSD. The solid state drives are not particularly big with a capacity of 128 GB each. In addition, the manufacturer has installed a 7200 rpm HDD with a size of 1000 GB to ensure plenty of storage capacity. 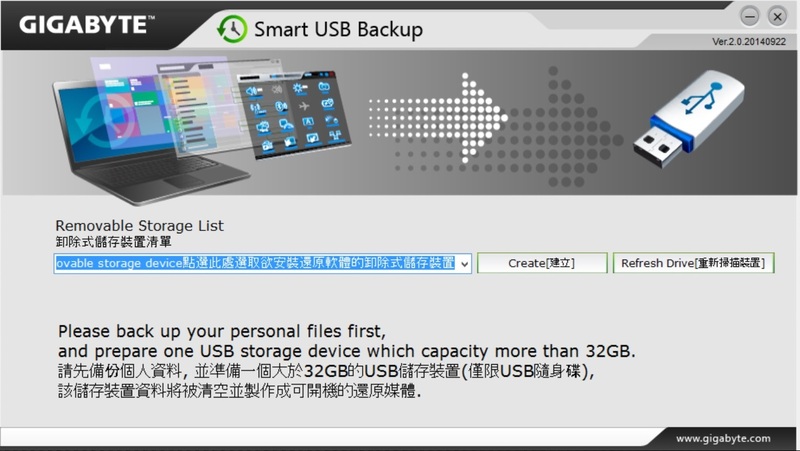 As mentioned in the intro, a fourth hard drive can be installed via the hot-swap slot. 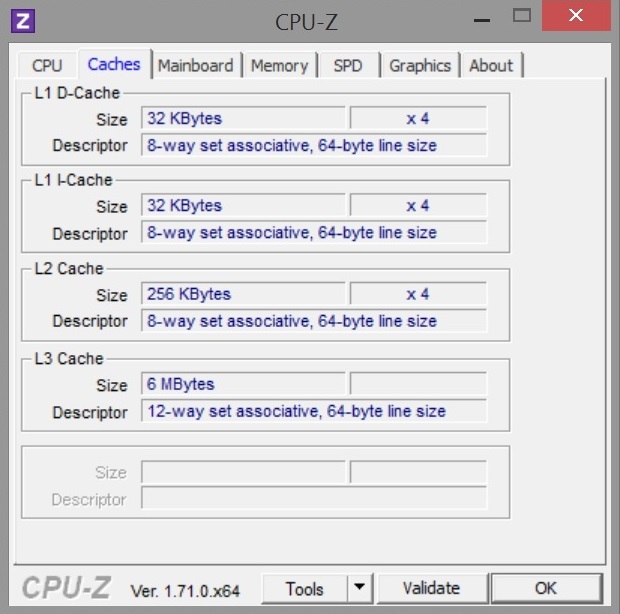 The system performance reflects the typical high-end level. 6035 points in PCMark 7 might even be the score of One's K73-4N (4800MQ, GTX 870M, 500 GB SSD) or Schenker's XMG P724 (4810MQ, GTX 880M SLI, 500 GB SSD). Gamers who do not want to make compromises, will find the GTX 980M absolutely right. Even computing-intensive games like Crysis 3, Watch Dogs, and Far Cry 3 are displayed in their full beauty on the screen. As long as extreme anti-aliasing is not selected, the DirectX 11 chip copes well. 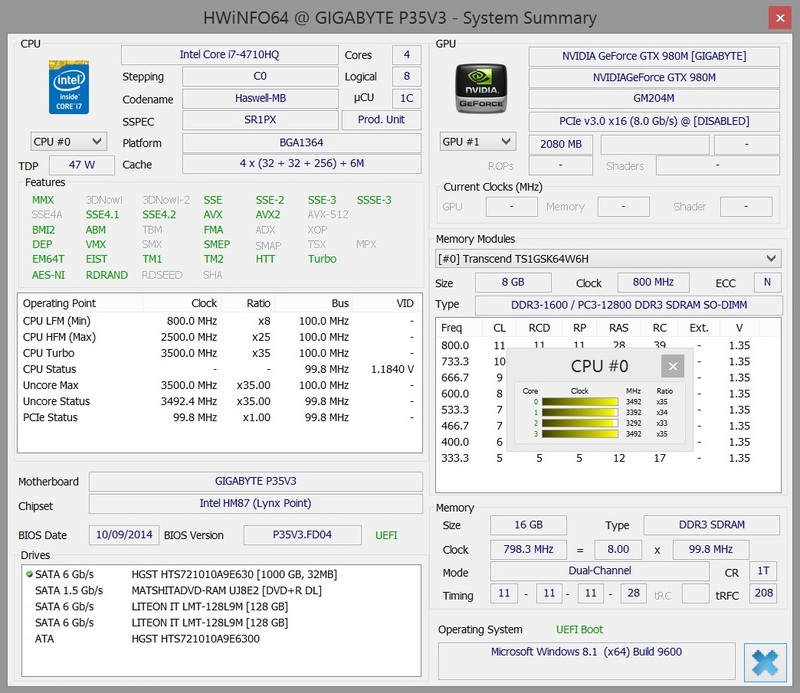 Overall, the frame rate is over 50% higher than Gigabyte's P35W v2 (GTX 870M). Currently, AMD barely plays a role in the high-end range. The Radeon R9 M290X is no threat at all for the GTX 980M. 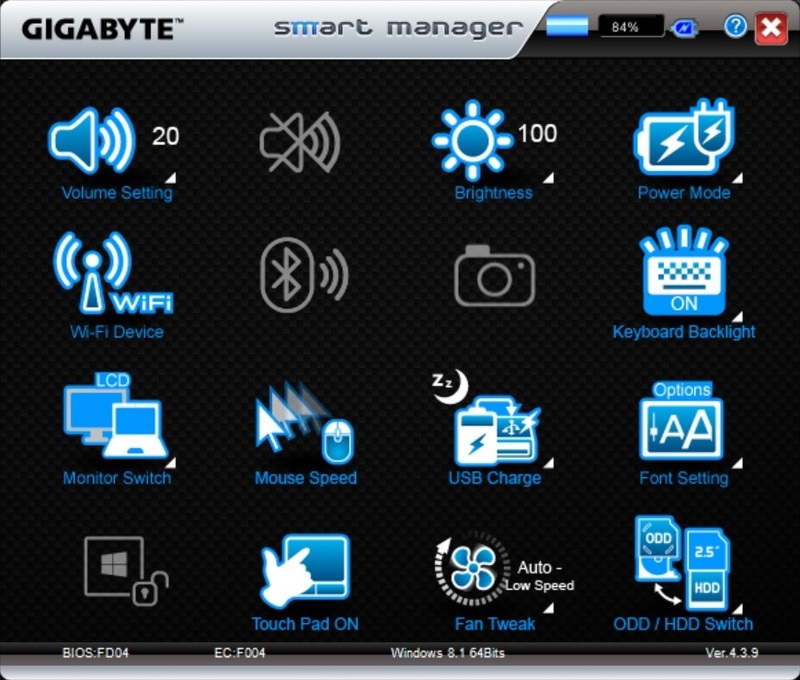 An option called "Fan Tweak" can be found in Gigabyte's "Smart Manager" software. It provides fan control settings that range from "Stealth" up to "Max Fan". We performed the assessments using "Auto - Low Speed" (idle) and "Auto - High Speed" (load). 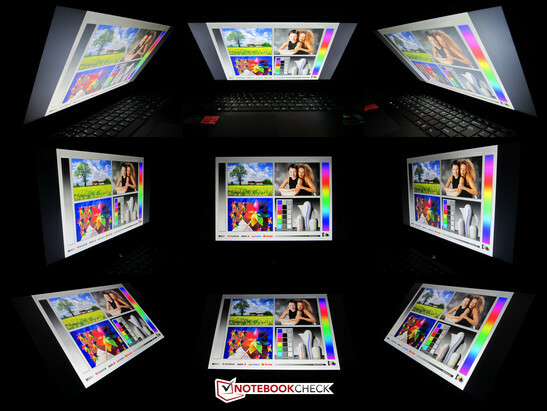 The system is often silent when the 15-inch laptop is idling, though when listening closer, a minor whistling can be heard (like in the Aorus X7 Pro) that however is not distracting. The fans reached approximately 32 dB(A) in routine tasks (office, Internet, etc. ), which is also quite pleasant. 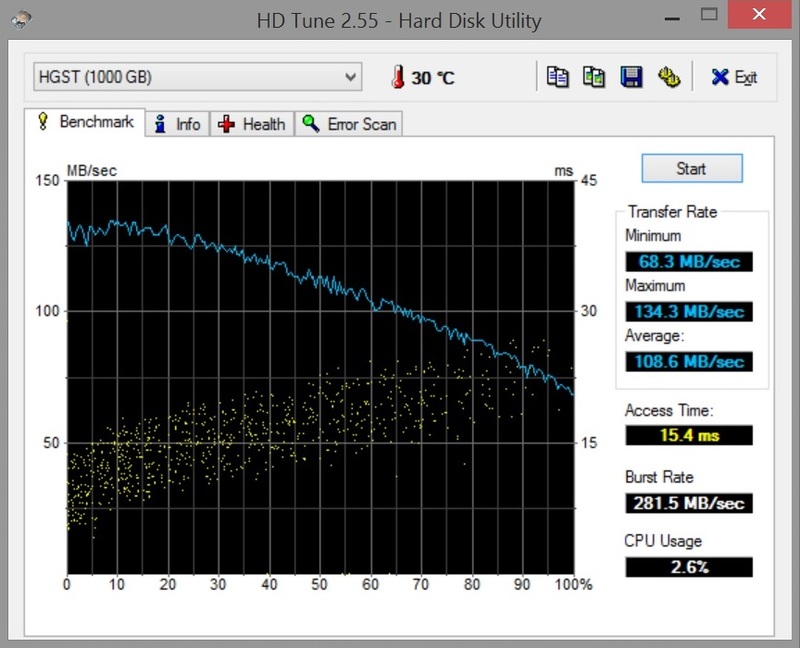 Even the hard drive spins with roughly 32 dB(A) when accessing data (otherwise 31 dB(A)). We have to criticize the occasional speed increase; the noise level sometimes increased to 36 dB(A) for no reason. However, this behavior is known from other laptops as well (Clevo barebones are infamous for this). Generally, the P35X v3 is extremely audible in gaming mode. The cooling reached over 50 dB(A) just in medium 3D load. A maximum of 55 dB(A) in the stress test is also steep, and most laptops undercut that. Our review configuration of Schenker's XMG P505 "only" reached 51 dB(A) after one hour of full load (FurMark + Prime95). Due to the design aspects of the build, the P35X v3 is faced with above-average temperatures. Almost 36 °C (~96.8 °F) in idle mode are rather average, and point to high temperatures in 3D mode. The metal chassis reached up to 51°C (~124 °F; upper side) and 60 °C (~140 °F; underside). However, the wrist rest only climbed to a maximum of 34 °C (~93 °F). Other slim-gaming machines also have a tendency for high temperature development. Schenker's XMG P505, and the Aorus X7 Pro also turn into a "frying pan" during long gaming sessions. The tropical temperatures are even higher inside the casing. 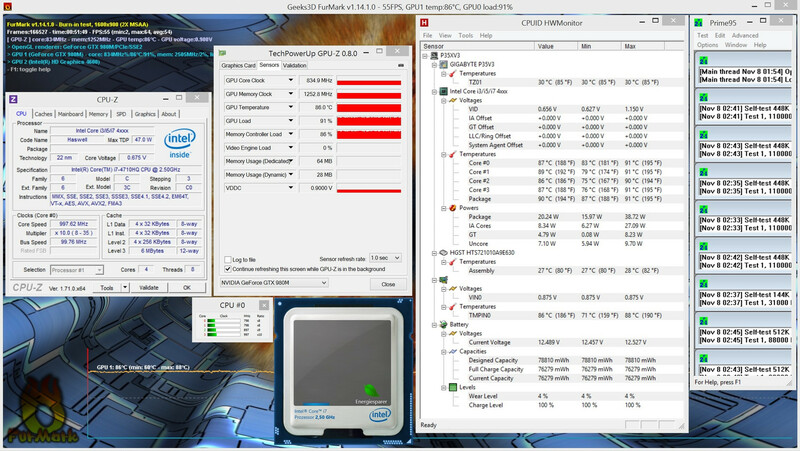 Despite the high-speed fans, the Core i7-4710HQ reached up to 91°C (~196 °F) during full load. 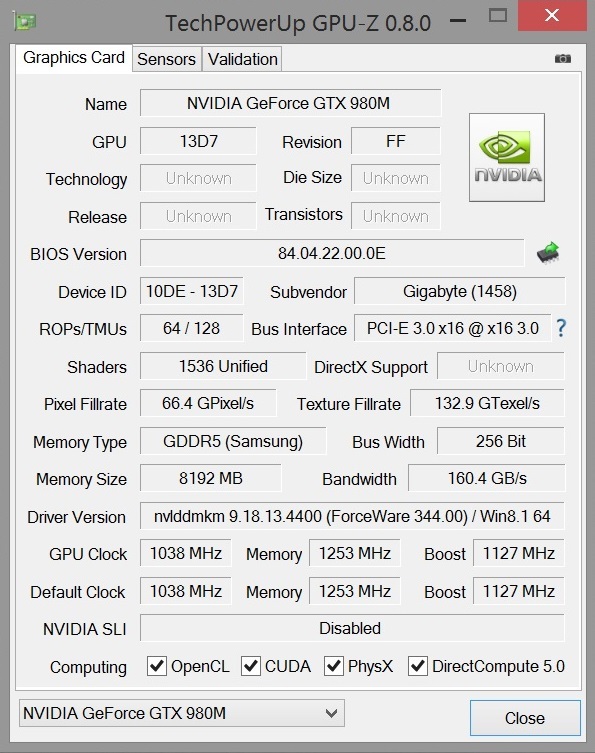 The GeForce GTX 980M also got very hot with a maximum of 88 °C (~190 °F). However, the temperatures are not problematic, particularly since the rates are likely to be lower in routine gaming. (-) The average temperature for the upper side under maximal load is 42.7 °C / 109 F, compared to the average of 32.9 °C / 91 F for the devices in the class Gaming. (-) The maximum temperature on the upper side is 51 °C / 124 F, compared to the average of 39.3 °C / 103 F, ranging from 21.6 to 68.8 °C for the class Gaming. (±) In idle usage, the average temperature for the upper side is 34.9 °C / 95 F, compared to the device average of 32.9 °C / 91 F.
(-) The average temperature of the palmrest area of similar devices was 28.7 °C / 83.7 F (-5.7 °C / -10.2 F). As we have already described in the P35W v2 review, the sound quality is rather poor. The 2.1 sound system produces a quite tinny, unbalanced, and muddy sound as typical for laptops. The Dolby Digital Plus technology cannot do much about that either. The atmosphere in games, videos, and music clearly suffers without an external speaker or headset. MSI proves that this can be done better in slim laptops (GS60, GE60, etc). As expected, the Maxwell architecture has a positive impact on energy requirement. Although the P35X v3 is considerably stronger than the P35W v2, the 3D power consumption is similar. 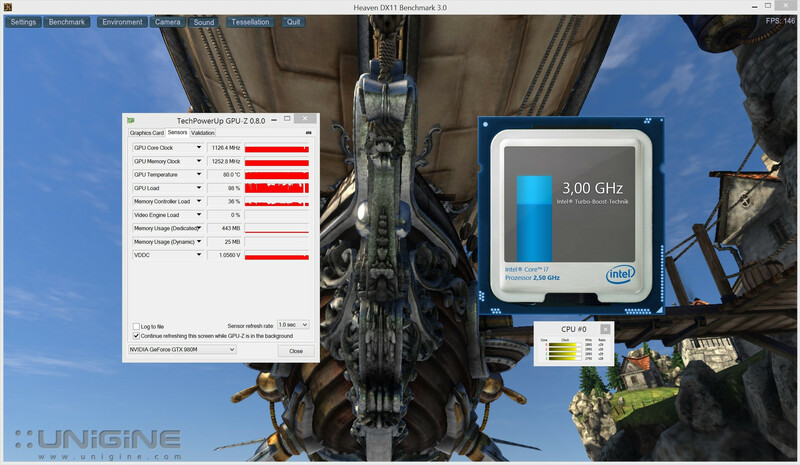 Just under 108 Watts in the first scene of 3DMark 06, and up to 181 Watts in full load are acceptable for a premium-range laptop. The maximum consumption would be higher if the CPU did not throttle in the stress test (the clock occasionally dropped to 800 - 1000 MHz). In any case, Gigabyte is content with a 180-Watt power supply, which seems rather tight in our opinion. The Optimus technology massively reduces the idle power consumption. 16 - 26 Watts are quite easy on the wallet. The battery life deserves the label "viable". Almost 1.5 hours in high load (maximum brightness), and up to 6 hours in idle (minimum brightness) are decent. We could not perform more tests due to the short loan period. The 75 Wh, lithium polymer battery is one of the stronger units of its kind. Hot and loud: These are the cons of the P35X v3. Gigabyte has not managed to cool the gaming hardware properly. Not really surprising since the chassis has a height of only 21 millimeters (~0.8 inches). That takes us to its biggest asset: There is hardly any other premium-range laptop that is so light, compact, and portable. The first glance does not give an indication of the powerful innards inside the metal chassis. The GeForce GTX 980M is currently the fastest laptop GPU for gamers. The other components are also compelling. 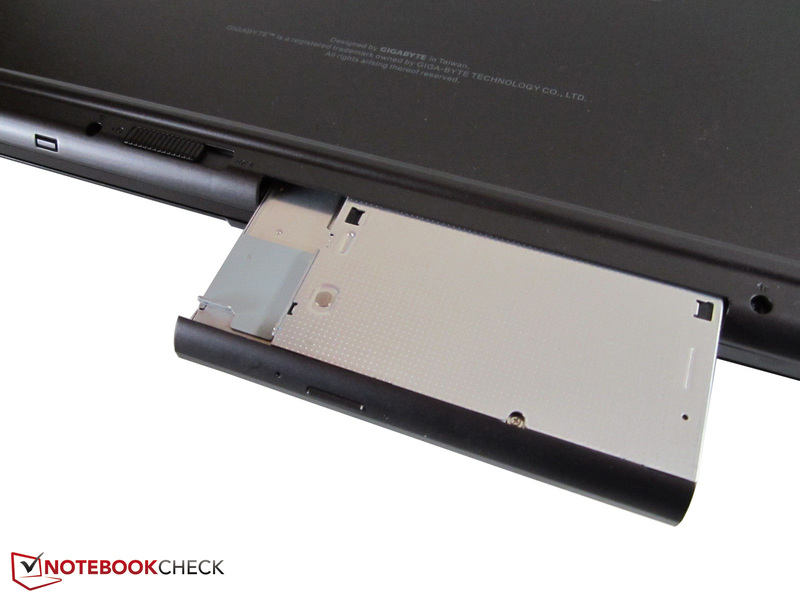 In addition to the mSATA SSDs, we would mention the hot-swap slot here. 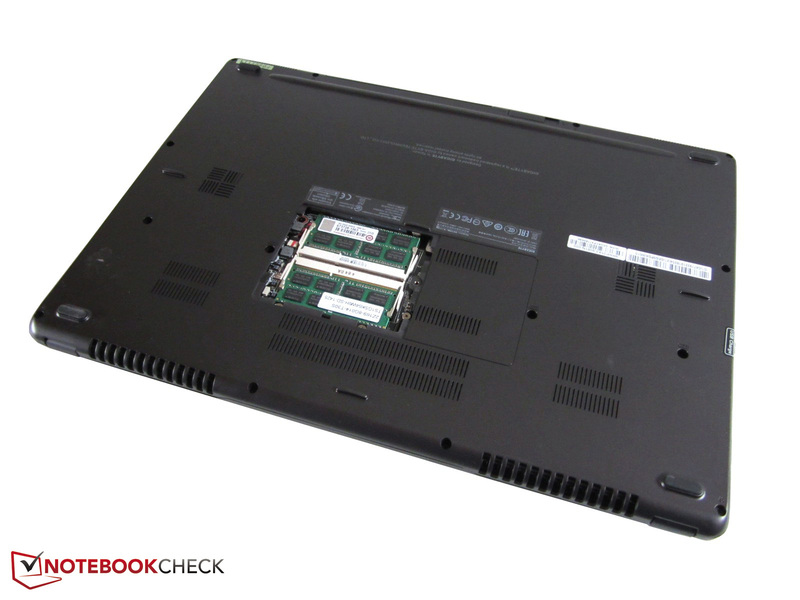 It reminds us of Lenovo's Ultrabay (IdeaPad Y510p). The screen proves even more luxurious. 2880x1620 pixels ensure a razor-sharp image. 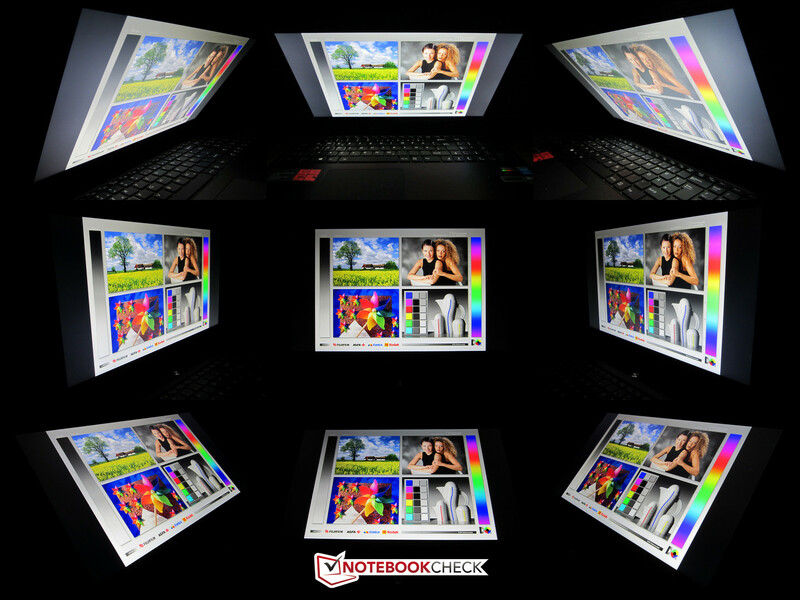 The screen basically stands out with its high contrast, natural color reproduction, and superb brightness. 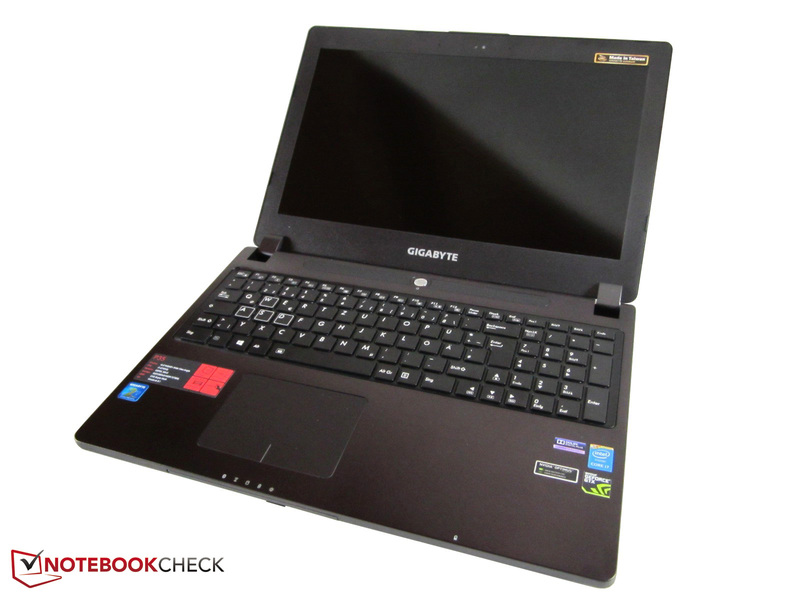 It is not least due to the mediocre speakers that prevent the 15-inch laptop from achieving a perfect rating. The wide display bezel and unstable CPU Turbo are also annoying. Temperature and noise sensitive users should take another device. Anyone who is attracted by the concept, can give the P35X v3 a chance. 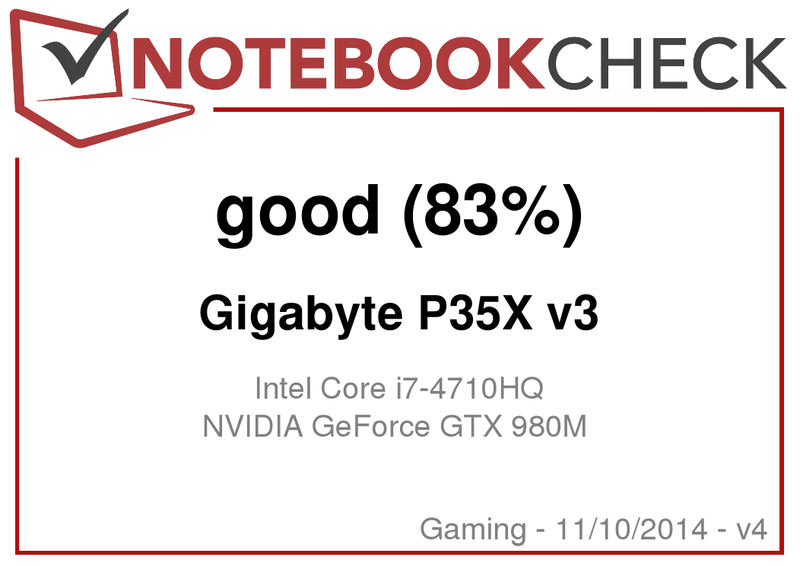 Gigabyte P35X v3. Review sample courtesy of Freaks 4U Gaming GmbH. The casing is largely metal. The P35X v3 is quite rigid despite its slim build. 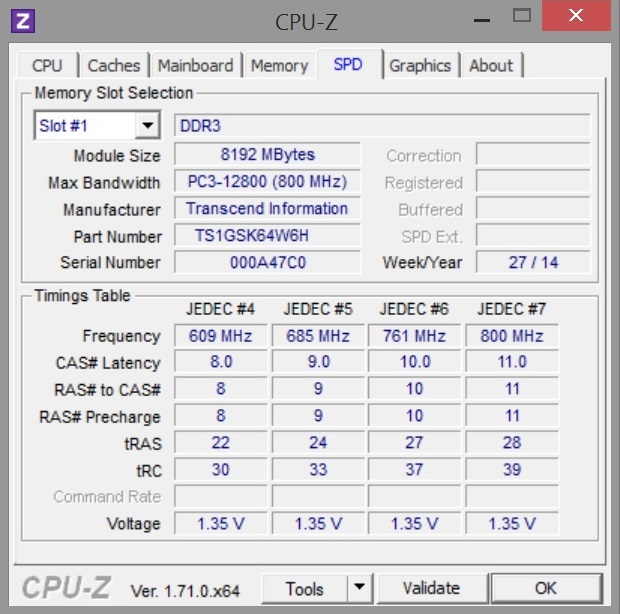 The DDR3 RAM banks are easy to access. Optical drive or 2.5-inch storage device? The choice is yours. 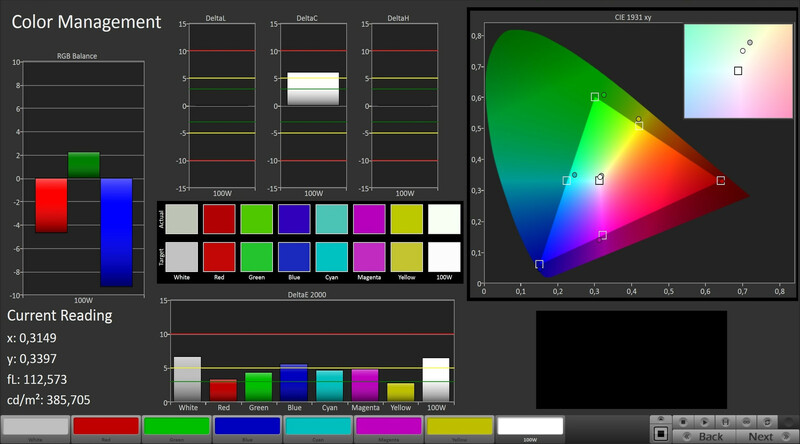 The 3K screen is bright, high-contrast and colorful. A quieter laptop in 3D applications. 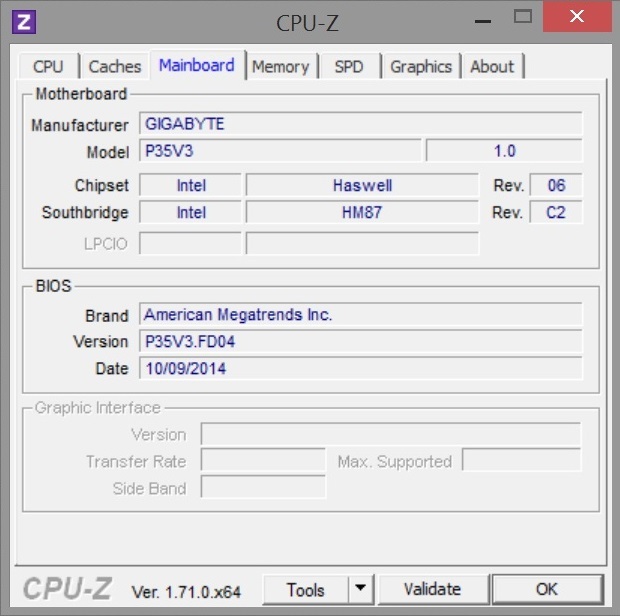 The CPU's limited Turbo is very noticeable in games. Slim, premium-range laptops with a GeForce 900 graphics, like Aorus X7 Pro or Schenker XMG P505.